Its no secret that the ACT (and success in college as a whole) is dependent upon a high-level of reading comprehension. The science section on the ACT has much, much more to do with reading and understanding a non-fiction, technical text than it does your memory of mitosis or Newton's 3rd law. "don't-you-dare-call-on-me" silence of death I've gotten our 2 days of class when I asked for a reader, I'd be willing to bet they are not high. I don't think the students at my school WANT to be poor readers, and most of our low readers probably carry some shame about and would put in work to raise their skills, but putting in the hard work of catching up using reading texts that are not of personal interest to them creates a mental barrier. Rather than hurdle/climb/scratch/claw over it, many of our readers go the easier route of blaming something/someone else for their deficiencies, or they resign to "I'm not a good reader." As I was perusing the Chrome Web Store this week looking for more utility to add to my Chromebook, I ran into Newsela, a news aggregator that promises to give my students articles that will be of interest to them at a lexile/grade level score that I can set to best support them. I had really hoped Newsela ran on some super platform that used some fancy coding to take any article a student could throw at and replace synonyms, interpret meaning, and chunk long passages into shorter ones, but apparently I live in the future. Newsela DOES have a respectable amount of articles to choose from (updated daily), and I was even able to find one about the dance team from a school in my district that the +St Louis Post-Dispatch profiled last fall. Assign to students for reading. From their student account, they pull up their "binder" to find what you have curated for them. Highlight and annotate passages to give your students extra insight or further scaffold their reading. This is the layout of an article on Newsela. You have options to assign the article (or to hide it) at the top, the text in the main column with sharing buttons above the title, and choices to differentiate reading levels and assessment on the right in blue. Newsela doesn't ONLY replace "higher" words for lower, the editorial staff also provides subtitles and headings the lower you go down lexicles. 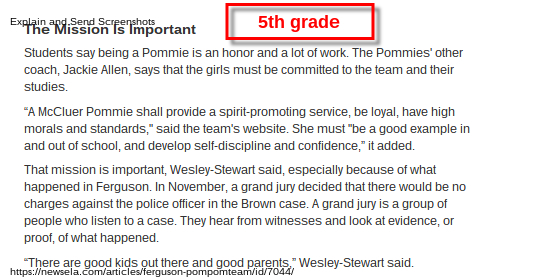 This is the same paragraph on the 5th grade and 12th grade reading level. Is it a PERFECT tool for getting your students relatable content? Probably not, but it gets you a long way in its ability to provide choice and scaffolding for your readers, and its faster than a classroom trip to the library for students to find and choose books on the appropriate level.